SCVHistory.com | SCV Healthcare | Volunteers Pave the Way to Henry Mayo Hospital. Volunteers Pave the Way to Henry Mayo Hospital. By Leon Worden | 2012. ©SCVHistory.com | Video by SCVTV | Images courtesy of Henry Mayo Newhall Memorial Hospital except as noted. 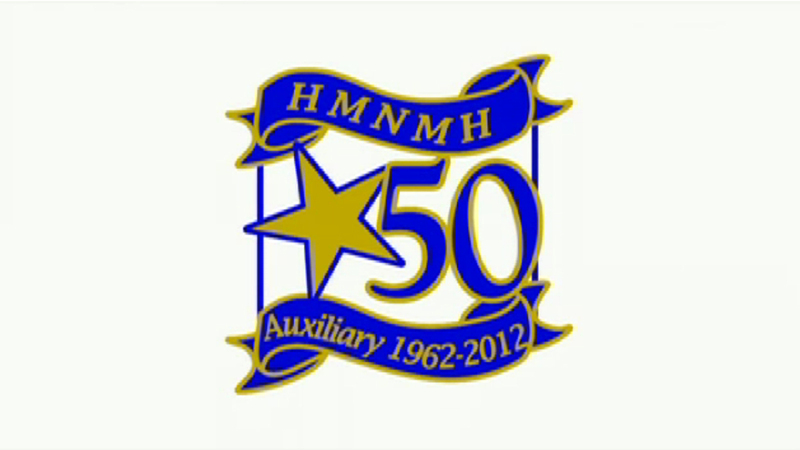 50-Year History of Henry Mayo Newhall Memorial Hospital Auxiliary, 1962-2012 | Video by SCVTV, Oct. 16, 2012 | Interviews (in order of appearance): Tony Newhall, John Fuller, Paula Cox, Joyce Wayman, Lea Serlin, Betty Burke Oldfield, Lucile Novack, Maria Strmsek, Gloria Barrett. The Santa Clarita Valley learned how ill-equipped it was to deal with a major disaster in the wee, dark hours of Oct. 12, 1962, when a southbound Greyhound bus slammed into a grain truck that had just pulled onto the fog-shrouded Ridge Route near Castaic. One female passenger died and 22 others were injured, including a 19-year-old sailor en route to his Navy ship at Long Beach. Victims were transported to Holy Cross Hospital in Mission Hills and to the little Santa Clarita Hospital at 21704 Soledad Canyon Road in Saugus. The sailor lapsed into a coma and never regained consciousness. 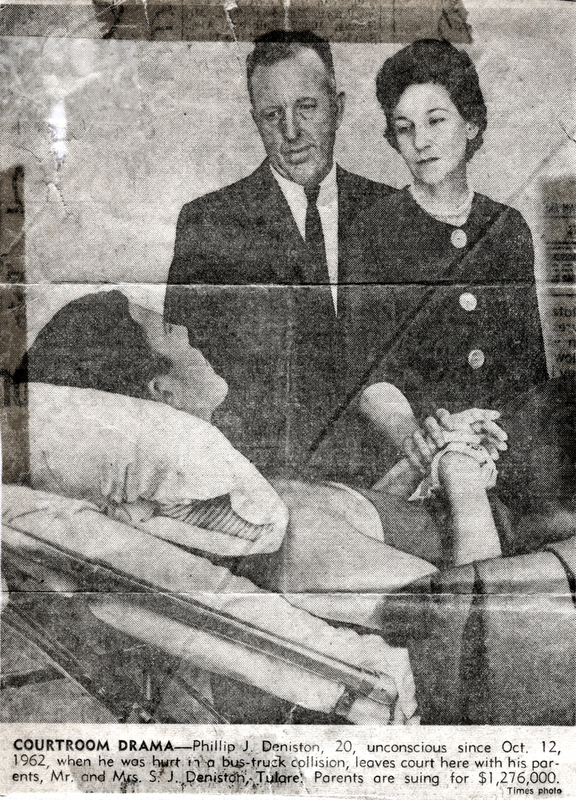 He occupied one of Santa Clarita Hospital's 19 beds for more than a year; not until 1964 would Santa Clarita Hospital add 62 beds in a new convalescent wing. The future 43-bed Golden State Memorial Hospital had not yet opened at 24124 Lyons Avenue, and Newhall Community Hospital, which started as a doctor's office in 1926 at Spruce (now Main) and 6th Streets, had just six beds and no ICU. Sailor Philip J. Deniston lies in a coma while his parents seek damages in court. They eventually received the lion's share of the then-largest amount ever awarded in Los Angeles County for a single collision. Their son never regained consciousness. Click image to enlarge. Eight or more Greyhound passengers who were treated at Santa Clarita Hospital, several in critical condition, hailed from communities stretching from Sacramento to Mexico. They needed more help than doctors and nurses could provide. They needed clothing and emotional support, and they needed to contact out-of-town family members — who would need help of their own to find their way around our still-remote valley. Lena Huntsinger, Santa Clarita Hospital's assistant adminis­trator, put out the call, and the community's leading ladies responded. "The Greyhound bus accident ... pointed up the real need for a hospital service group," Huntsigner said. "In this isolated area there is no place where people can turn for help when they have become stranded because of an accident." Huntsinger appealed to the Santa Clarita Methodist Church Women's Society of Christian Service to help establish a group of non-nursing volunteers to assist recovering patients. The following month, on Nov. 27, three women — Martha Barton, Jereann Bowman and Gwen Gillespie — drafted a set of bylaws for the new organization, which would be called the Santa Clarita Valley Women's Auxiliary. Its purpose was to "promote interest in person-to-person service within the community" and develop a "hospital service group composed of girls" ages 14-18. There were three classes of membership: Regular, consisting of adult volunteers; Patroness, non-volunteers who according to the bylaws were typically "wives of medical and administrative staffs"; and Junior — the candy stripers. Originator Lena Huntsinger, center, is flanked by two of the original Pink Ladies, Martha Barton and Mrs. Auby Lee. Click image to enlarge. The volunteers were already helping at Santa Clarita Hospital in December, before the bylaws could even be ratified. That happened at the organizational meeting Jan. 10, 1963, at Hart High School. Lois LoFiego was elected the first president; vice presidents were Sue Bedwell and Ann Cash — the latter succeeding LoFiego as president the following June — while Louise McJohnston, Betty Bullock and Barton rounded out the initial director positions. 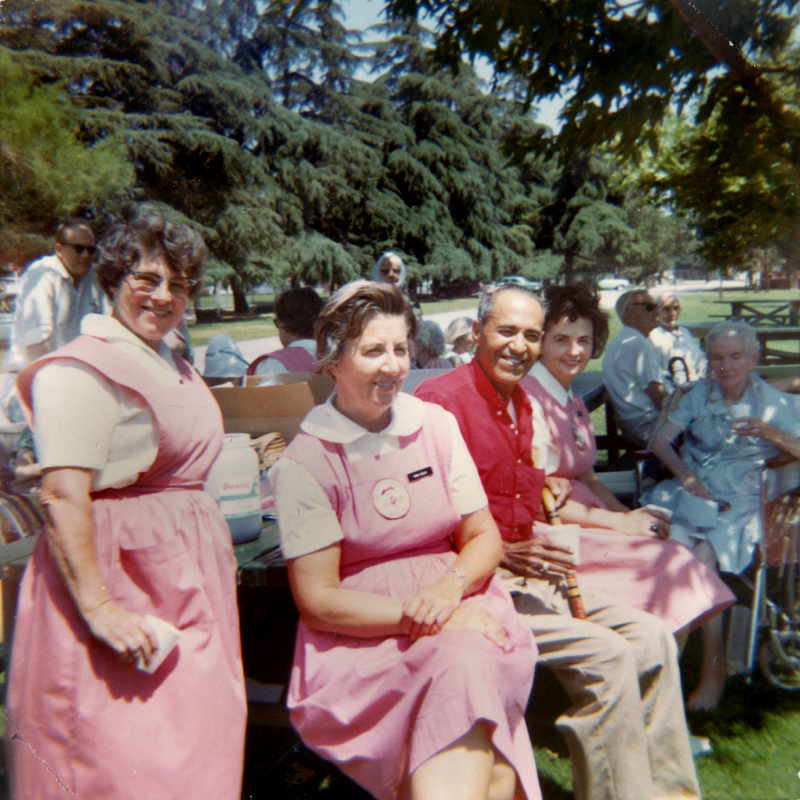 Santa Clarita Hospital provided the uniforms for the volunteers: the usual striped overalls for the junior volunteers and peach-colored outfits for the adults, who came be known as the "Pink Ladies" or, affectionately, "Pinkies." 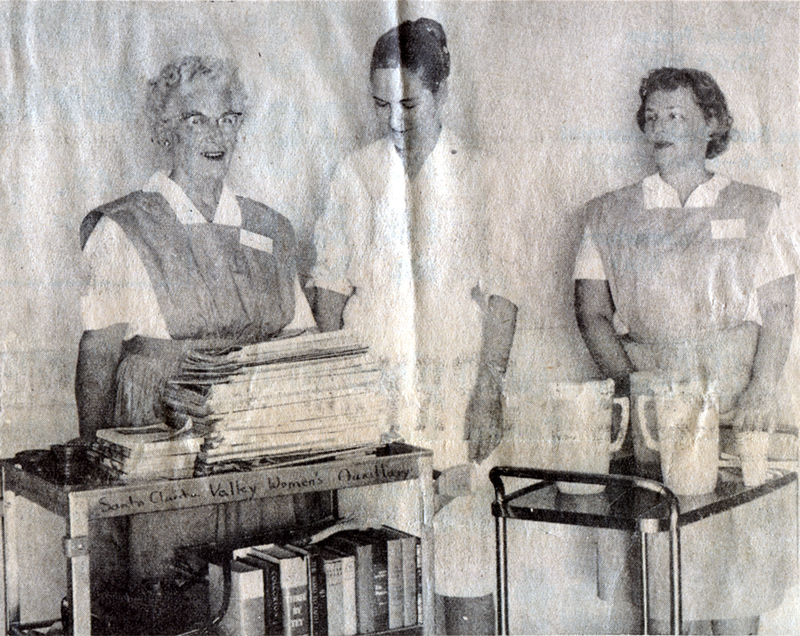 By mid-1963 a dozen Pink Ladies were visiting patients at Santa Clarita Hospital, feeding those who needed assistance, helping them write letters, and bringing them flowers, games and books. Forty-five girls from Hart High (then the SCV's only high school) signed up as candy stripers the first year, under the direction of Mrs. Oleita Hickox, Mrs. John Bodine and Mrs. Auby Lee. The young candy stripers elected their own board in June 1963: Martha Atkins (president), Pat Reyes, Sally Longoria, June Butts and Mary Munoz. Pink Ladies treat Santa Clarita Hospital's convalenscent patients to an outing at Hart Park in 1966. The convalescent wing opened in 1964. Click image to enlarge. Pink was naturally the shade of the punch, cake and corsages presented to the candy stripers and Pink Ladies at the annual teas, which coincided with National Hospital Week and by 1964 expanded to Golden State Hospital. Golden State primarily handled acute cases while Santa Clarita Hospital was focusing more on elderly care with its new convalescent expansion. In 1965 the Pink Ladies and candy stripers expanded their volunteer activities to a local Well Baby Clinic and Preschool Clinic operated by the Los Angeles County Health Department. That same year brought the Old Orchard Shopping Center at Lyons Avenue and Orchard Village Road. It was a portent of things to come. The Newhall Land and Farming Co. was planning an entire "new town" to be called Valencia which would quickly double the valley's population and shift its center of gravity to the west. The thousands of new residents would need more places to work, new places to study, and upgraded facilities in which to recover from illness and injury. When the birth of Valencia kindled an argument over the Santa Clarita Valley's name, Santa Clarita Hospital took on the neutral and nondescript name, "Inter-Valley." Click image to read the announcement. Branding was an issue. The name "Santa Clarita" evolved from "Santa Clara," first used in the 1700s. But as the communities of Newhall and Saugus took shape in the late 1800s, the valley came to be known as the "Newhall-Saugus Area." With the birth of Valencia on Aug. 20, 1967, Newhall Land wanted to rename the area "Valencia Valley," but this effort met vehement resistance from local old-timers. Newhall Land President Thomas L. Lowe recuited Lutheran Hospital Society to organize and finance the valley's first nonprofit, community-owned hospital, and he waded through the bureaucratic morass to get it built. (Photo source: Ruth Newhall.) Click image for more information. 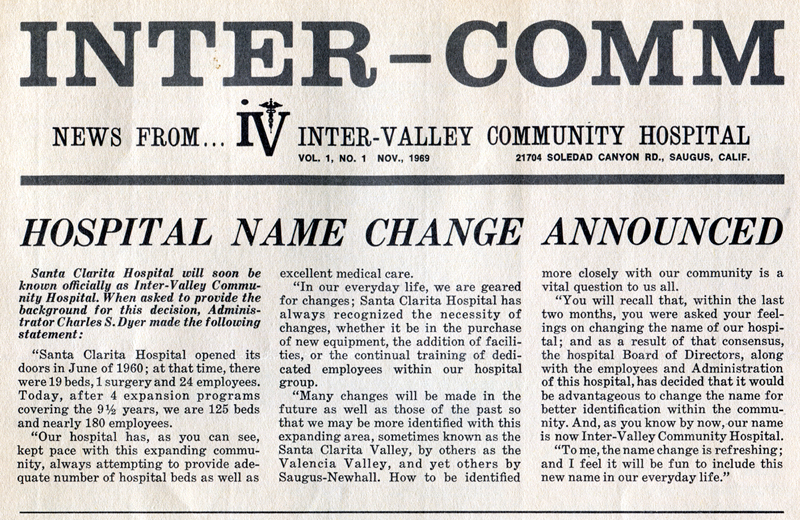 Sidestepping the naming scuffle, Santa Clarita Hospital Administrator Charles S. Dyer announced a name change in November 1969. Henceforth his hospital, now boasting 125 beds and 180 employees, would be called Inter-Valley Community Hospital, "so that we may be more identified with this expanding area, sometimes known as the Santa Clarita Valley, by others as the Valencia Valley, and yet others by Saugus-Newhall." Over in Valencia, Newhall Land President Tom Lowe was already talking to one of the state's oldest and largest nonprofit healthcare providers, Lutheran Hospital Society, about a hospital presence in the new town. Newhall Land and LHS recruited leading citizens to help promote and fund a new hospital to be called Henry Mayo Newhall Memorial in recognition of the landowner whose heirs incorporated his holdings as Newhall Land in 1883. Newhall Land executives and Newhall family members seeded the endeavor with $1.6 million in cash and stock. In 1970 the committee reorganized as the Henry Mayo Newhall Memorial Hospital board and placed Newhall Municipal Court Judge Adrian Adams at the helm. Members included Lowe, Samuel Tibbitts of LHS, and banker John S. Fuller as treasurer, along with a bevy of local movers and shakers: SCV Bank founder Elisha Agajanian, Dr. Arnold L. Barton from Inter-Valley, civil engineer Ed Bolden, Dr. Ciro S. Casas, John H. Clark, Vincent Cullinan, Samuel Fine, Chester H. Fortin, Matthew Gelso, Judge C.M. MacDougall, Peter McBean of the Newhall Land board, Jane Newhall, Claire Rider, founding COC President Robert Rockwell, Gordon Sim, musician Cliffie Stone and Dr. John O. Westwater. Newhall Land donated a 25-acre pad for the hospital, as seen here in 1968 or early 1969. (Photo source: Tony Newhall.) Click image for more information. 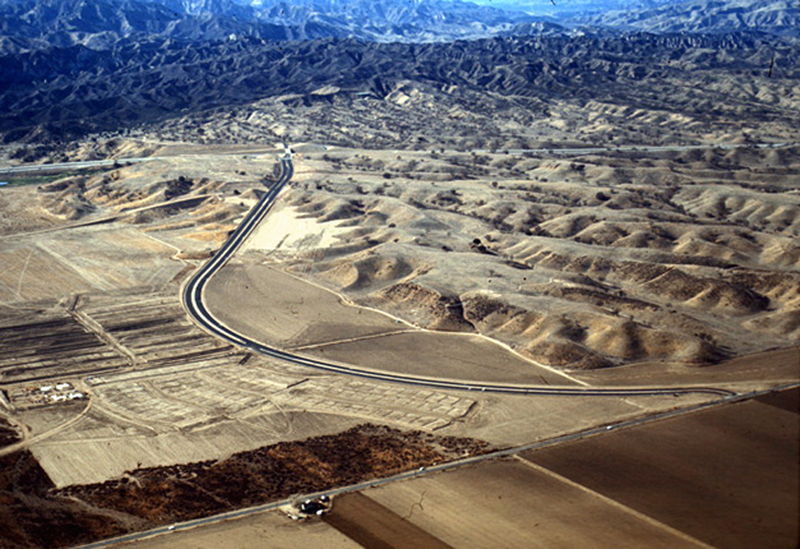 Newhall Land pledged a 25-acre site at the future "T" intersection of McBean Parkway and Orchard Village Road for the hospital, and in December 1970 the board launched a drive to raise the rest of the $8.5 million needed for construction. LHS negotiated loans that enabled the plans to proceed in the interim and later guaranteed financing of a medical office building adjacent to the hospital. In February 1971 the board hired its first employee, Bobbie Trueblood, wife of the former newspaper publisher, as its director of community relations with the charge of spreading the word about the future hospital and organizing support groups. 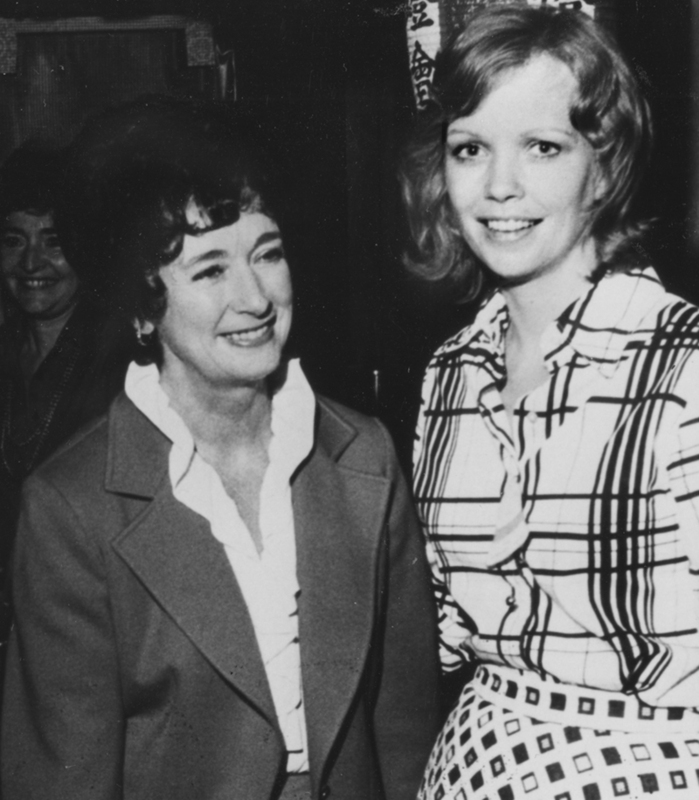 Bobbie Trueblood (left), seen here with Ronald Reagan's daughter Maureen, was Henry Mayo's first official employee. (Photo source: Fred Trueblood III.) Click for more about Bobbie. That same month the so-called Sylmar earthquake of Feb. 9, 1971, killed 65 people and caused $500 million in property damage. Most deaths and injuries occurred in the San Fernando Valley, alleviating the strain that would otherwise have befallen the local hospitals — which were better prepared for such a calamity than they were in 1962, thanks in part to their participation in simulated disaster exercises sponsored by the Los Angeles County Medical Association. Plans for Henry Mayo Newhall Memorial Hospital were nearly complete when the earthquake struck; now they would have to be reworked to meet evolving seismic safety requirements. 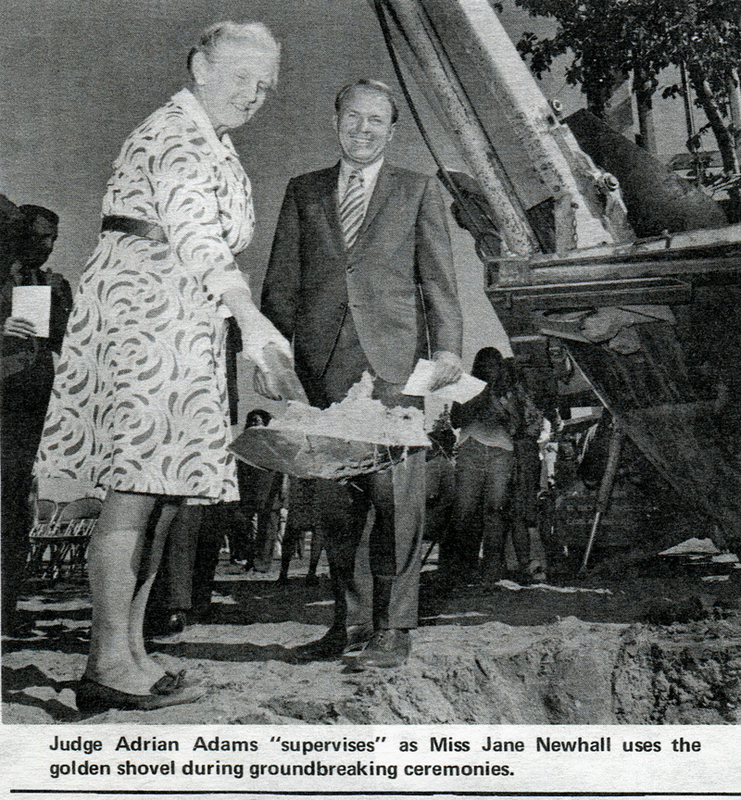 Jane Newhall, great-granddaughter of the hospital's namesake, participates in the September 1972 groundbreaking ceremony with hospital board chairman Adams. Click to enlarge. Project approval came June 25, 1971, when the regional governing body — the Comprehensive Health Planning Association of Los Angeles County — gave Henry Mayo the green light during a four-hour meeting at Holy Cross, over objections from Golden State hospital partisans who had filed a similar application for a new facility. 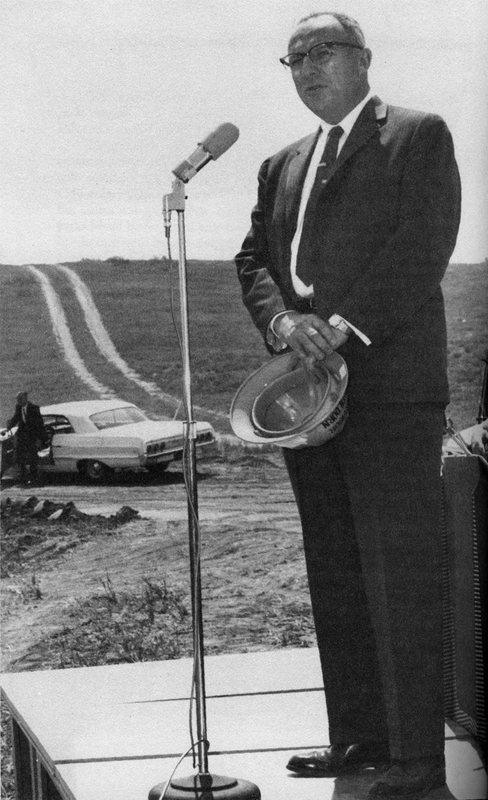 Ground was broken next to the newly extended McBean Parkway in September 1972. Architects and engineers hired by LHS consulted with the hospital board and coordinated the construction. Nurses, technicians and therapists from LHS facilities provided input on the design of specialty areas within the new hospital. Pink Ladies pose with the sign for the newly renamed hospital in Saugus. Click for individual ID's. Meanwhile, rather than reinvent the wheel and recruit a whole new medical and nursing staff, LHS took one over when it purchased Inter-Valley to serve as an interim facility. 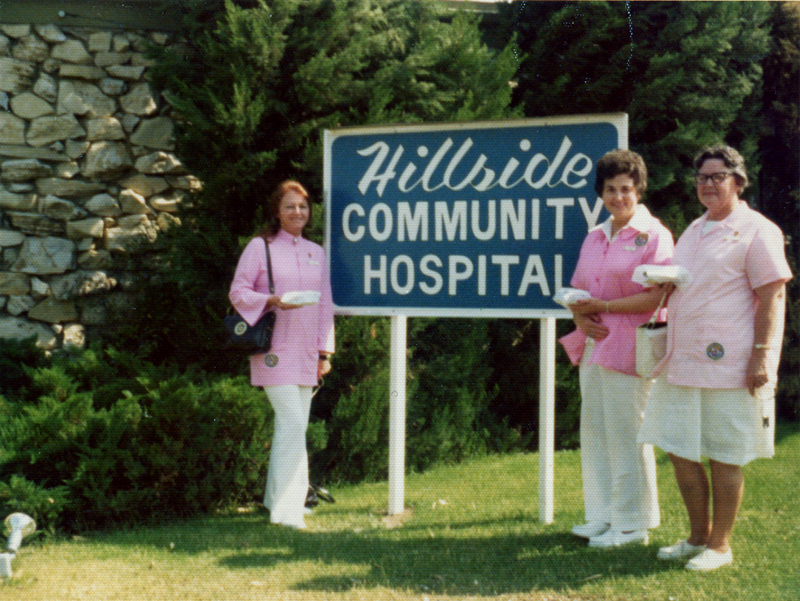 Renamed Hillside Community Hospital, the existing facility enabled LHS to recruit additional doctors and nurses, and helped the volunteer board generate more community interest and support. Hillside generated about $1 million in profit during this period, which became working capital for the new hospital in Valencia. 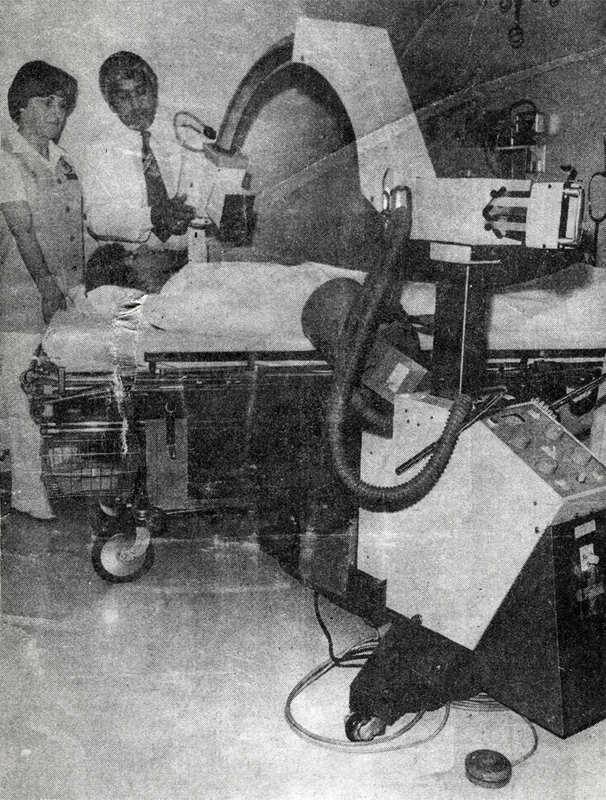 After Henry Mayo opened in 1975, hospital volunteers continued to raise funds for capital acquisitions like this portable X-ray machine. Click to enlarge. Construction was completed in 1975, and with Hillside providing continuity for the staff, it was a fairly smooth move when Henry Mayo was ready to open for business that August with 100 patient beds, a paramedic base station and a 680-square-mile service area. The hospital provided the Santa Clarita Valley with its first fully licensed intensive and coronary care units, while an adjacent medical office building accommodated 15 physicians' offices and a retail pharmacy. Now, with a modern hospital, together with widened freeways, two new institutions of higher learning, a new center for court and government services, an emerging business park, and the growth-inducing monetary policies of the "Reagan '80s" just around the corner, the Santa Clarita Valley was poised for rapid development. Download individual scrapbook pages here. 2. The sailor was Philip J. Deniston of Tulare. Contemporary newspaper accounts identified him as Phillip (two L's), but his gravestone at Blooming Grove Cemetery in Clay County, Ark., where he is buried alongside other family members, shows him as Philip (one L) and gives a birth date of Oct. 26, 1942. "Never regained consciousness" — per communication of Aug. 20, 2012, with Charles Batten, a close friend of Deniston. Said Batten: "It was so strange to see him lying in bed, looking so healthy, and they managed to maintain his normal weight." 3. Deniston was still comatose a year later when he was wheeled into court as his parents sued the bus line. They were awarded $429,102.07 of a total sum of $660,008.62 awarded to multiple victims — then the largest jury award in Los Angeles County for a single collision. At some point, the sailor was probably transferred to a hospital outside of California; Batten (op. cit.) did not remember where he was hospitalized when he died on Feb. 20, 1967. The sailor's father, S.J. Deniston Jr., predeceased him in 1965; his mother, Mary Kathleen (Wright) Deniston, died in 2005. 4. Golden State filed its articles of incorporation Sept. 18, 1962. 5. In August 1769, explorer Gaspar Portola and his party passed through the area and named its river and its principal canyon (i.e., the valley) Santa Clara, the Spanish form of St. Clare. In the 1940s, considering the confusion that existed with the northern city of the same name, locals started using the diminutive form, Santa Clarita, or alternately, the Little Santa Clara River Valley. 6. It should be noted that the name "Canyon Country" was not yet in use. The area was considered part of Saugus. 7. The epicenter was in the Iron Canyon area of Sand Canyon in the eastern Santa Clarita Valley.